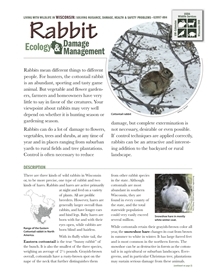 In this, the fourth publication in the “Living With Wildlife in Wisconsin” series, the authors describe the lives, habits, and habitat of the eastern cottontail rabbit and snowshoe hare, both natives of Wisconsin. These creatures consume lots of different kinds of food, including garden vegetables and flowers in spring and summer, and bark of woody plants in fall and winter—which is why they are not welcome guests in everyone’s back yard. The authors suggest a variety of ways to deter rabbits from ruining your garden or landscape plants, such as by encouraging (or at least not interfering with) hawks and snakes and other natural enemies of the rabbit, by removing brush piles and other habitat features they are fond of, by excluding them with proper fences or barriers, or by trapping or shooting them.